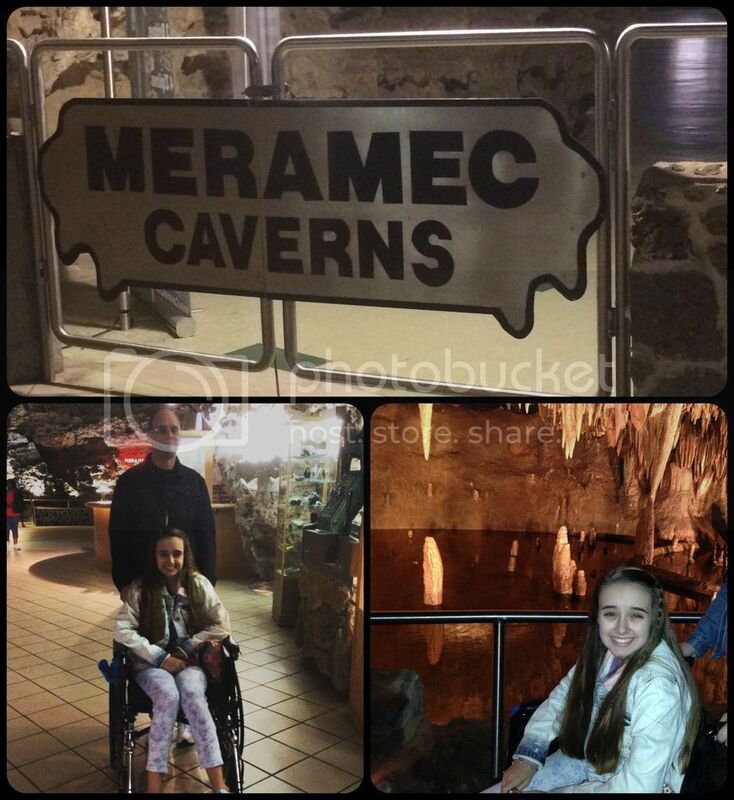 We have been trying to take Amber to these caves for a couple of years, but her illness made it so difficult. We finally decided to set a day and just go. Our actual day was back in the middle of August. The guided tour is roughly 80 minutes of continuous walking with some fairly steep inclines. We knew Amber couldn't physically handle the tour without the wheelchair, and she happily used it on this trip. I'm always amazed by Missouri once we get out from the city and suburbs. It appears the entire habitable portion of our state was cut from forested land. Even in the outlying suburb where we live, the trees abound and take over any space not actively kept clear. Pictures from the window as we drove. 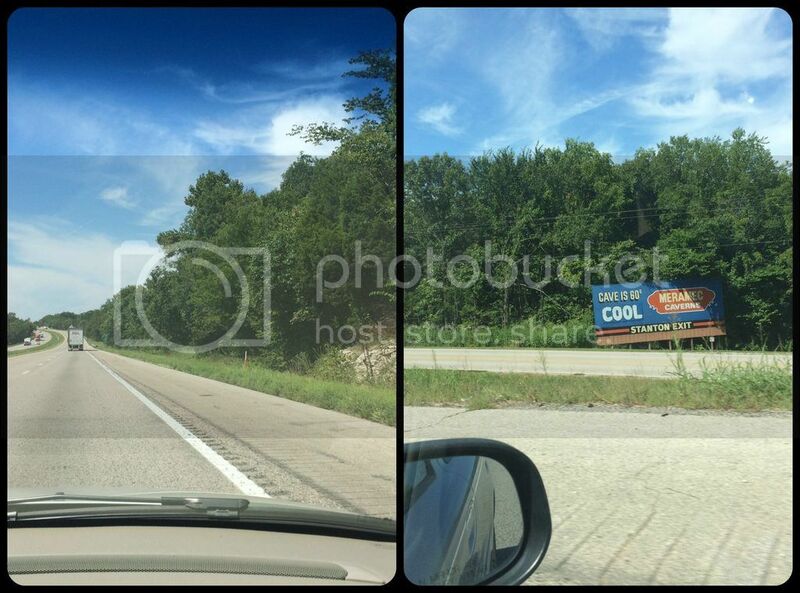 This is pretty much what driving in Missouri looks like. Amber is just now noticing this feature of her home state, which was very apparent when we drove to Minnesota earlier this summer and as we have been on field trips since. To her it is natural to see trees everywhere. Even our interstates are cut through the tree covered hills of the Ozark mountains. 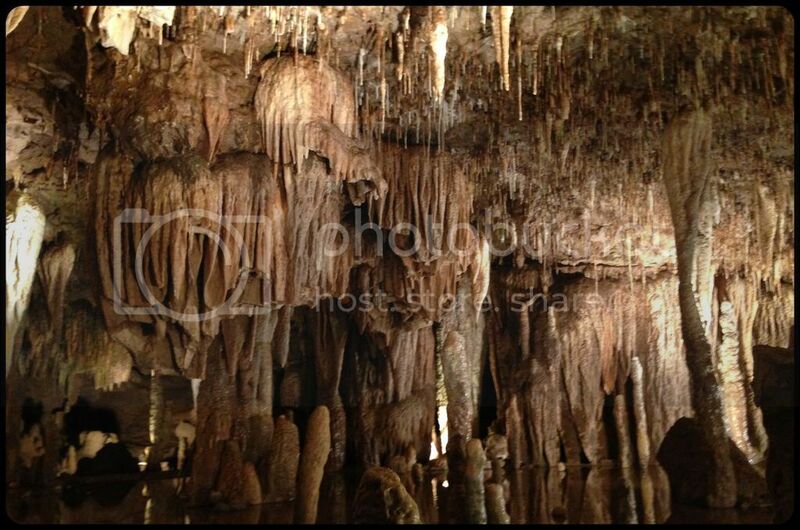 Amber had never been in a real cave or cavern before this trip, although they abound in Missouri. 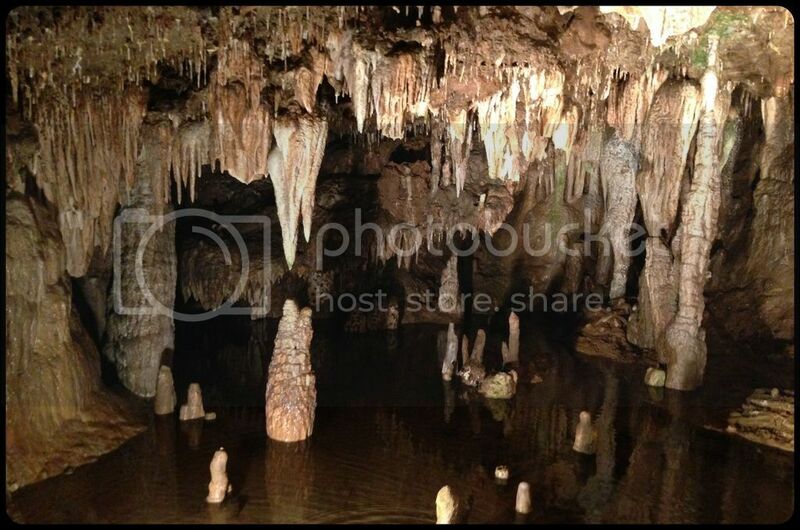 This particle cave system is famous for having once been the hideout of Jesse and Frank James and their gang. Well, at least after one robbery. Waiting for the tour, and next to the underground river. That water is absolutely, perfectly clear. Luckily for us the majority of the tour is wheelchair accessible and Amber was able to ride the entire way, with the help of Fred who pushed her up and down the steep, damp paths. The first part of the tour winds through the lower section of the cave where a clear spring river runs right next to the walkways. This is the section Jesse James and his gang are believed to have used to hide out and divide their stolen loot. The upper section has a massive onyx hill that has cut off its own water supply on one side and is still active on another. We had to bypass one room which could only be accessed after climbing 58 steps. Apparently it has many uniquely shaped formations. Lastly, the theater room has a "curtain" and screen area made entirely from deposits. 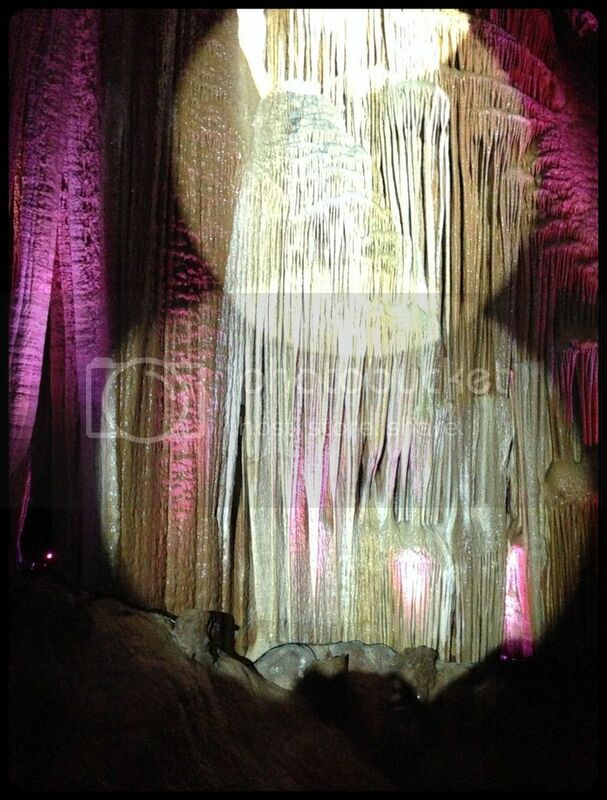 The tour includes a light and music show displayed on the natural screen. We intended to also take a river boat ride on the Meramec, but much of the additional ammenities were closed for an unknown reason, including the restaurant and boat rides. It was still a fun trip and Amber truly enjoyed her first visit to a cave. 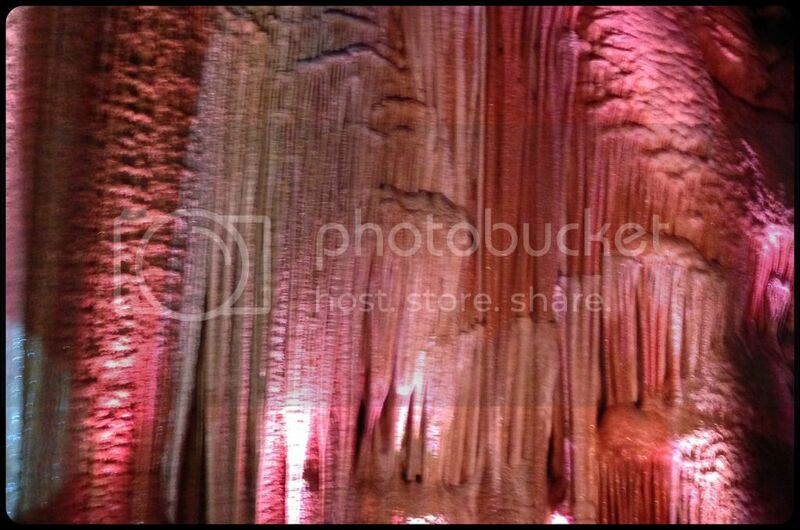 Light show on the "screen"
That looks like a marvelous cave tour. I am happy you were able to take Amber in the wheel chair. I am sure that made it a much more possible and fun experience. 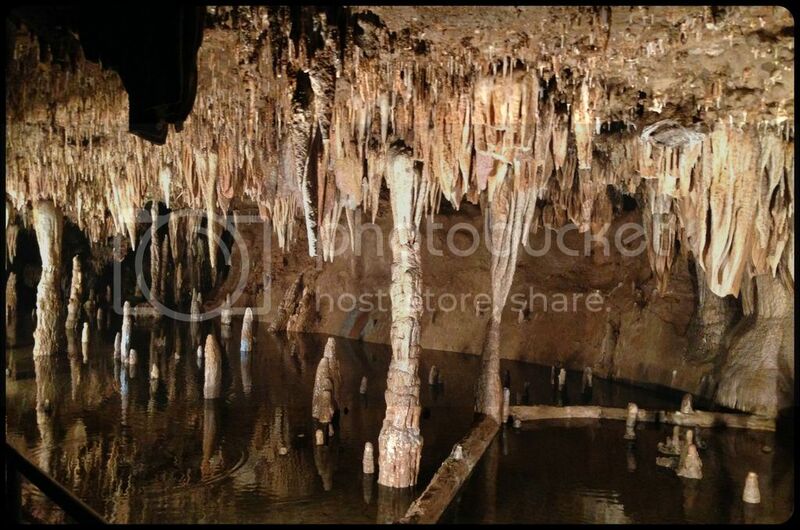 I have been in some mines and one cave that is much smaller than that. That is beautiful, amazing. I am glad that Amber was able to make the tour. I can't imagine roads without trees although here they are all pines.